Today's employment market is the toughest in recent history. But you can still get the job you want, if you apply fresh approaches to the search. To maximize your success, I'm providing the tools and resources you'll need – all 100% FREE! 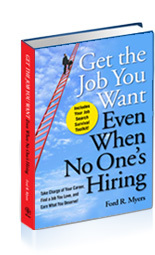 Bonus Gift #1: 50-page excerpt of my best-selling book "Get The Job You Want, Even When No One’s Hiring"
Bonus Gift #4: Audio interview with author Ford R. Myers, entitled "Surefire Techniques to Get The Job You Want in Any Economy"
Author of "Get The Job You Want, Even When No One’s Hiring"
Simply enter your information below to get instant access to all four gifts – and I'll see you on the next page right after you click the "Submit" button. YES, please give me instant access to the FREE gifts! "Get The Job You Want, Even When No One’s Hiring gave me the knowledge and discipline to advance to the next level in my career. When I was devastated by a downturn in the job market, the strategies outlined in this book gave me the skills to go out and secure a new position. I highly recommend this book to anyone looking for a new job after a layoff!" "Get The Job You Want, Even When No One’s Hiring offers solid advice to help job seekers adjust their mind-sets while improving their skill sets. Beyond offering a comprehensive set of exercises, this book provides the tools to get you on track and keep you moving forward during these challenging times. 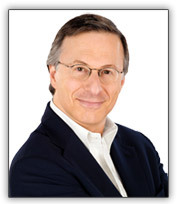 Ford Myers’ street smart techniques will help you take control of your career and succeed in your job search!" "Without your no-nonsense information about the negotiation process, I'm sure I would have settled for the first salary figure offered to me. I used the strategies in Get The Job You Want, Even When No One’s Hiring, and the result was a $4,000 increase in my starting pay. Your book helped me negotiate the best deal for my new position!" "I found Get The Job You Want, Even When No One’s Hiring to be the most comprehensive approach for organizing my career transition. All the exercises, forms and examples are exceptionally practical and productive. They are on-target and provide a great roadmap. Using this system has significantly improved the focus and success of my job search!" "Get The Job You Want, Even When No One’s Hiring is the ultimate guide for helping job seekers find better jobs in these extraordinarily difficult times. It’s packed with practical, easy-to-understand instructions that walk the reader through the entire job search process. Equipped with these insights, you'll be able to beat out your competition, land a better job, and earn more than you thought possible!" Click here to buy my book, "Get The Job You Want, Even When No One’s Hiring"